He has developed and published proficiency tests in English as a second language and in 15 other languages. He is the author or editor of over a dozen books and research monographs and 50 research articles published in professional journals. He is currently a member of the editorial boards of Language Testing and the Journal of Second Language Writing. 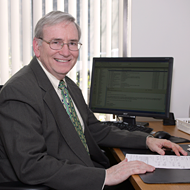 Since 1994, when SLTI was incorporated, Dr. Stansfield has devoted himself full-time to the management of SLTI projects. You can find more information about Dr. Stansfield’s Qualifications in the right menu.